The KTM 500 EXC-F is the strongest dual sport bike in the world, although that doesn’t mean it’s hard to control. This motorcycle is as lean and civilized as a thoroughbred race horse. But let it rip, and its 4-stroke SOHC engine blasts the cutting-edge chassis across any terrain you choose. Ahead of the competition. No sweat, just glory. BODYWORK: KTM R&D, KISKA Design and the factory racers had their say in shaping the plastics with one goal: complete harmony between rider and bike. Perfect ergonomics and contact points provide maximum comfort in movement on the EXC-F. The I-beam structures of the front and rear fenders guarantee maximum stability and a low weight thanks to well thought-out construction and mounting. They also stay cleaner for longer. Clever brake hose routing on the front number plate prevents wear and tear. DECALS: Graphics convey the READY TO RACE character of the EXC-F model line. FRAME: The high-tech, lightweight chrome-moly steel frame has a knack for easy handling, outlandish rideability, precise cornering and excellent stability. You can also count on high torsional rigidity and low longitudinal stiffness. This results in better absorption of the energy created from the front and rear suspension, sucking up jumps and bumps. In short: more comfort and less rider fatigue. Laterally attached, lightweight aluminum engine head stays (the connection between cylinder head and frame) contribute to precise cornering and a reduced vibration level. The engineers could pull off all that, while keeping their frame 2.2 pounds lighter than that of the lightest competitor on the market. In addition, it is easier to maintain, easier to work on and supplies more space for the tank and other components. The bike also features an extra-light subframe made of strong and lightweight aluminum, which tiptoes the scales at less than 2 pounds. SWINGARM: This state-of-the-art swingarm allows for an optimized mounting position of the PDS shock absorber, providing more progressive action. Furthermore, the cast aluminum design guarantees lower weight and a perfect flex behavior. The single-component casting process also eliminates any inconsistencies and weak points. WHEELS: The EXC-F’s wheels feature lightweight, CNC machined hubs and high-end Giant rims guaranteeing maximum stability at minimum weight. The wheels are fitted with Continental TKC 80 tires – perfect for surefooted performance off-road and stability on-road. REAR SUSPENSION: The WP Xplor PDS is a newly developed shock absorber. The PDS is a KTM trademark feature where the shock absorber is directly connected to the upper side of the swingarm. This setup boasts the best possible mounting geometry and provides amazingly progressive damping. The shock absorber is mounted close to the centerline, which means nearly symmetrical loads for the swingarm and frame and more space for the exhaust system. A second piston works together with a closed cup (instead of a needle) towards the end of the stroke and is supported by a progressive shock spring for exceptional bottoming resistance. Various machined and anodized components and a distinctive WP color trim make this a valuable, high-end product compared to the less refined shock absorbers of the competition. You’d hate to see it get dirty. Almost. FRONT SUSPENSION: The WP Xplor 48 upside-down fork is a split fork developed by WP in close collaboration with KTM. It is fitted with a spring on both sides but features separated functions for each fork leg: compression damping is fitted on the left side, while rebound is on the right. So the forks can easily be adjusted with the twist of a dial on the top of the forks. New outer fork tubes and a reworked setting make for more sensitivity, improved damping behavior and a reduced weight. In addition, a sealed hydro-stop guarantees excellent resistance to bottoming-out. Due to high-quality materials and a state-of-the-art production process, the new WP Xplor 48 fork – with approx. 300 mm of travel – has outstanding response and damping characteristics. A comfortable preload adjuster (standard for SIX DAYS models, retro-fittable for standard models) allows for a simple spring preload setting in three steps without tools (standard, + 3 mm, + 6 mm). TRIPLE CLAMP: The EXC-Fs are fitted with forged triple clamps with an offset of 22 mm, ensuring a solid grip of the fork and precise handling. The handlebar is adjustable forwards and backwards over 4 positions, so the EXC-F will fit you like your favorite gloves. BRAKES: You can’t brake any harder, better, faster or stronger. High-tech Brembo calipers are combined with lightweight Wave brake discs. The steel-flex front brake hose has efficient protection and there’s an integrated channel for the speedometer cable. First you outrun them, then you outbrake them. AIR BOX: The air filter box design offers maximum protection of the air filter against soiling, while ensuring maximum airflow in a quiet way. The large Twin Air filter is mounted in a stiff cage, which at the same time holds the system in place. This design is so simple; you can pop a fresh one in with a face full of mud – without tools and in seconds. FUEL TANK: The lightweight polyethylene tank has a capacity of 2.25 gallons. You will always be able to see how much fuel remains at a glance, thanks to the see-through plastic. By pushing the orange release button in the center of the fuel tank cap, the bayonet mechanism makes refueling quick and easy. It is fitted with an integrated fuel pump system and a fuel level sensor. Additionally, the fuel line features a 90° connector to the tank for better protection against damage. ENGINE: Small in dimensions, sky-high on output. The KTM 500 EXC-F’s fuel-injected powerhouse makes it the most compact and lightest 500 on the market, while delivering groundbreaking torque and power figures over the entire rev range thanks to a single overhead camshaft cylinder head and the latest electronic fuel injection. Class-leading and cutting-edge: just the way we like it. CYLINDER AND PISTON: Inside the cylinder, with a bore of 95 mm, thumps a forged box-type piston with an ultra-light piston pin. Its crown geometry is adapted perfectly to the combustion chamber, where its rigid structure and low weight shine. Thanks to low oscillating masses, the engine is as smooth as it is powerful. CYLINDER HEAD: A single overhead camshaft controls intake and exhaust through optimized ports, while a cutting-edge combustion chamber and water jacket create mind-blowing power while managing heat. The engine’s four valves rely on extremely rigid rocker arms. Double lateral brackets fix the engine to the frame and reduce vibrations. 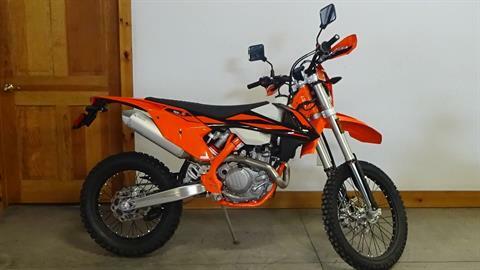 CRANKSHAFT: The KTM 500 EXC-F’s crankshaft utilizes a short connecting rod, which makes for an overall compact and lightweight engine with a snappy power delivery. A plain big (bottom) end bearing with two force-fitted bearing shells runs directly on the crank pin. The necessary oil feed for this bearing is ensured by the engine’s pressurized lubrication. This design is a decisive benefit in terms of the crankshaft service interval, which can be lengthened due to the plain bearing. So just pin it, all day long. CRANKCASES AND ENGINE COVERS: The design of the die-cast crankcases allows for minimal weight and a very centralized shaft configuration. This makes the engine short and compact, while contributing to an efficient centralization of masses. The engine covers also feature a solid surface structure, which reduces the wear caused by the rider’s boots. This way, your EXC-F will keep looking better longer. TRANSMISSION: The reliable 6-speed transmission features a special surface treatment on the 2nd, 3rd and 4th gears for solid reliability. The advanced ´No Dirt´ gear shift lever design prevents dirt from jamming the joint of the lever and guarantees precise shifting even in the muddiest conditions. The transmission shaft has a bearing that has a bigger overlap in the cases. This means reliability even under extremely hard conditions. Think GP-level riding. In knee-deep sand. And a stronger shifting star made of MIM steel (metal injected molding) improves reliability even further. ENGINE MANAGEMENT SYSTEM: The state-of-the-art Keihin engine management system with electronic fuel injection features a 42 mm throttle body. Thanks to its unique injector position, the engine’s response gives a whole new meaning to the word ‘instantaneous’. Separate circuits for cold-starting and idle make on-site adjustments easy. Push the throttle back when the engine is warmed up and the cold start mode disengages. E-STARTER: The KTM 500 EXC-F is fitted with a unique E-starter as standard, which is a clear advantage when it comes to crunch time in the heat of battle. A strong starter motor and a reliable lithium ion battery will fire up your 500 time and time again at the push of a button. In order to reduce weight to the minimum, there is no kick-starter system. You won’t miss it. If by any chance you do, just retrofit a KTM PowerParts replacement kit to get your kicks. BALANCER SHAFT: To balance the mass forces, the KTM 500 EXC-F engine uses a multifunctional, side-mounted balancer shaft, which at the same time drives the water pump. It has been balanced to perfection, keeping vibration levels to a minimum, even while gunning it to the maximum. 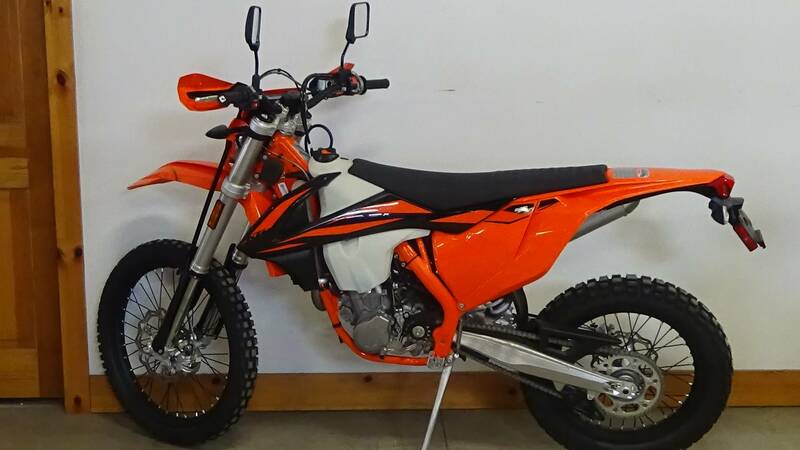 CLUTCH: The KTM 500 EXC-F employs the KTM-developed DDS clutch (damped diaphragm steel) with a wear-free steel basket and extremely heat resistant clutch plates and new, nitrated steel liners. This clever design employs a diaphragm spring instead of the usual coil springs, making for considerably easier clutch action. A diaphragm spring also leaves sufficient space for a damping system to be integrated into the clutch hub. The goal is traction, but durability is as well. Light operation and telepathic amounts of control are standard with this hydraulic Brembo actuated clutch. EXHAUST SYSTEM: Noise limits are a real challenge for every manufacturer. Therefore, KTM has put a lot of effort into the development of its exhaust systems. All 4-strokes are fitted with a short high-end aluminum muffler, mounted as close to the engine as possible. This means more power, extra mass centralization and better rideability. An advanced internal design reduces the noise sufficiently to sit safely below the noise limit, while still providing the engine response and performance that is expected from a KTM. HANDLEBAR: KTM engineers know how to handle handlebars. This tapered unit, made of high-strength aluminum by NEKEN, features a throttle assembly with a robust aluminum body and easy free-play adjustment. An ODI vulcanized grip sits on the right, while on the left side of the bar a comfortable ODI lock-on grip requires no glue or wire to secure it. You can retrofit two interchangeable throttle cams, for different response characteristics to suit your specific needs. FOOTPEGS: Sophisticated ´No Dirt´ footpegs prevent jamming up of the pegs, even when digging in deep ruts. The pegs on the EXC models are 6mm higher than the ones used on SX models, which benefits ground clearance. But you can swap them at will. BATTERY & WIRING HARNESS: A strong lithium ion battery breathes life into the engine and contributes to low vehicle weight. The lightweight battery and wiring harness are centralized in a compartment above the air filter box, allowing the mechanic to remove the subframe without moving the electronics. A happy mechanic is a good mechanic.